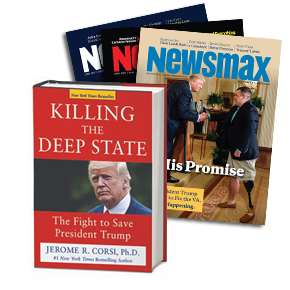 In Killing the Deep State: The Fight to Save President Trump, Dr. Jerome Corsi reveals for the first time powerful evidence that the Deep State is seeking to remove President Trump from office. Inside his explosive new book, Killing the Deep State, Corsi lays it all out — from the alarming evidence for the coup d’état to take out President Trump to the plan that will allow the president and patriots to destroy this dangerous shadow government for good. Corsi offers the “smoking gun” proof that the FBI has now taken the lead to stop Trump once and for all. He also provides new evidence that Barack Obama and Hillary Clinton and their key lieutenants are orchestrating the Deep State — relying on many of his most trusted aides who are still in the government working for President Trump! Killing the Deep State shows that the investigation led by Robert Mueller, the former FBI director who served under Obama, is nothing more than a political witch hunt. Corsi says President Trump is key to restoring America, protecting the U.S. Constitution, our borders, and our way of life — and the man who can destroy the global New World Order. Have you ever wondered why . . .
Just 24 hours after her loss in the presidential election, Hillary was already touting the Russian collusion theme? It was part of this FBI “insurance policy.” Pages 6 and 19. The FBI’s Robert Mueller has turned a blind eye to the open and brazen efforts of the Bureau to first back the Clintons and now sabotage Trump? Page 104. Russia was funneled U.S. military technology and 20% of all U.S. uranium production as part of the “Russian reset” . . . Pages 111-113. Popular Fox News host Glenn Beck, MSNBC’s Pat Buchanan, and CNN’s Lou Dobbs were all forced off their networks? Find out which powerful figure in the Deep State was behind this rabid attack. Page 124. Obama wants black America against President Trump and how antifa activities became designated as domestic terrorist violence by U.S. Department of Homeland Security . . . yet the mainstream media still champions their cause and hails them as heroes? Page 134. FBI counterintelligence agent Peter Strzok, who once led the Clinton email probe, changed the wording in James Comey’s speech about Hillary’s handling of classified information through her private email server from “grossly negligent” to “extremely careless”? Page 7. It took so long for government officials to admit the Fusion GPS dossier was a fake — paid for by surprising sources. Were the FBI and Obama behind it as well? Page 90.